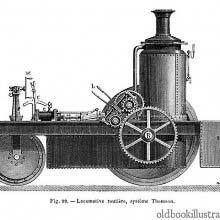 Mr. Dupuy de Lôme's two-cylinder steam engine. Cross section. 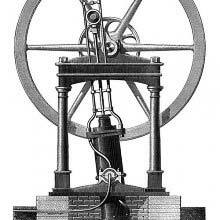 This steam engine was designed by Henri Dupuy de Lôme to be fitted on steamships. The horizontal position of the cylinders shows that they were intended to operate a propeller, whereas, in the case of paddle steamers, the cylinders were positioned vertically. In addition to the above device, gearing had to be used to give the propeller shaft sufficient rotation speed. The caption reads in the original French: Machine à deux cylindres de M. Dupuy de Lôme. Coupe.